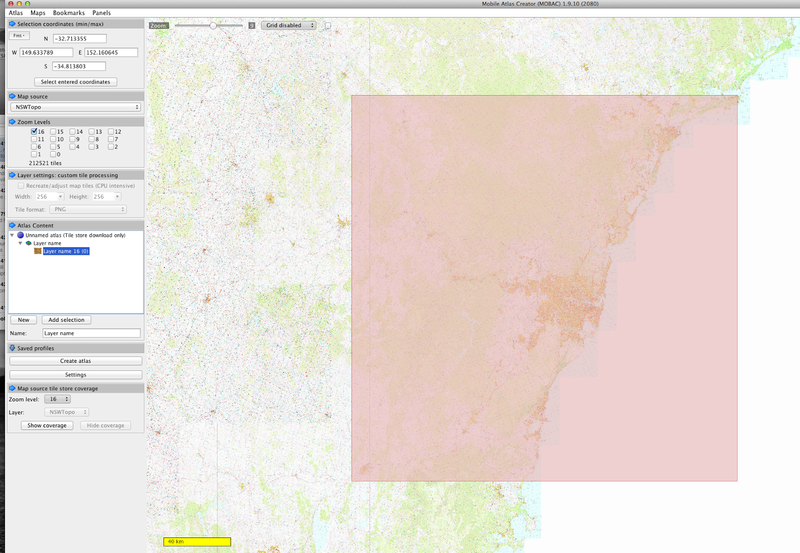 I’ve been trying to track down a digital source of NSW topographic maps for some time now. The paper editions, as well as often being of the 1st (1960’s production) edition, if available at all, are printed on woefully thin paper that’s lucky to survive a single outing to the bush. I’d like to print my own. 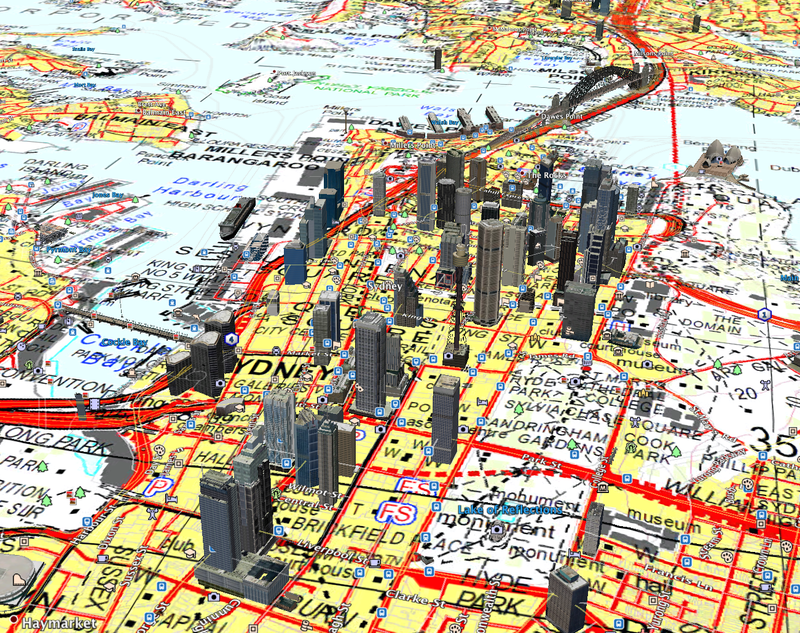 Even better, I’d like to have them as raster overlays on my GPS. I have the Garmin vector maps, which I understand are generated from the same GIS database, but a reference raster chart from the local mapping agency themselves gives me a degree more confidence in the accuracy of the data published. The GPS cannot download maps in real-time off an online server, and neither would there likely be any mobile coverage in the area it was being used in anyway (so the iPhone is out too for that use-case), so I also need to be able to locally cache whatever data is available. After a lot of trawling, it appears that the LPI do indeed (and only recently… this only seems to have popped up in the last few days) publish a cached tile service from their ArcGIS server. This can be accessed as a cached tile service compatible with MOBAC (Mobile Atlas Creator), a WMS service, or as a KML SuperOverlay service that can be displayed as an overlay in, say, google earth. The largest scale tiles look to be rendered (according to the layer metadata) at 1:9027 at 96dpi, which by my maths comes out at about 1:28000 if printed at 300dpi. This should be plenty good enough for printing or overlay use. I do not know whether this service is intended to be used in this way, or whether this service will still be up tomorrow. The tiles are acquired from the same server as the server used by a ruby script that acquires vector map data from another service. As much as this is cleverly done, I found most of the tiles I attempted to acquire were supplied as cached rasters, and that getting the correct visual styling was therefore not possible. The raster tile source it uses gets scaled on the server and so the rendering quality there left something to be desired. This method appears successful for raster tiles due to its simplicity. Zoom levels 0-15 appear poorly scaled. They are not rendered for the larger scale. I recommend just working with layer 16 for navigation. It looks like the series 1 maps are also published. I haven’t checked these to see if they have been adjusted from AGD66 to WGS84/GDA94 datum. The tiles are published using the EPSG:4326 projection, so I would expect that they have. I realise six viewer is NSW only. Do you have any scripts for topos other states?